It all started last year when Timothy Paule had a cold he couldn’t kick. One day someone recommended he try some local honey. Paule learned that commercialized honey is often stripped of medicinal properties, whereas raw honey offers several health benefits, such as eliminating mucus and suppressing coughs. He soon felt better. Paule then started thinking about the city’s vacant lots, and how they’re not only an eyesore and breeding ground for crime, but how they trigger allergies with overgrown ragweed. During his research, he also learned that bees thrive on vacant lots that are free of harmful pesticides. 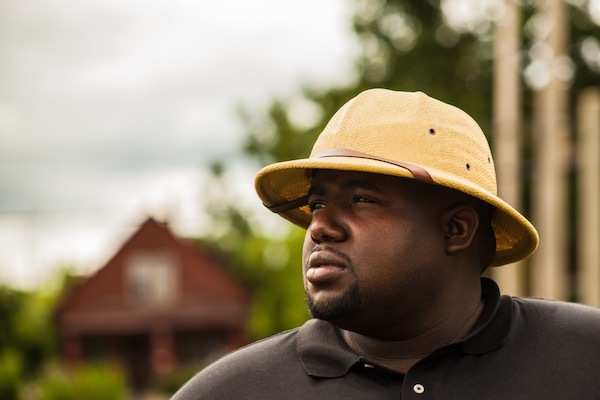 Earlier this year, Paule and business partner Nicole Lindsey founded Detroit Hives and bought a lot on East Warren Avenue from the Detroit Land Bank Authority for $340. Where previously there had been overgrown 4-foot-tall grass, wild trees, and tires strewn about, it’s now home to a bee farm with a groomed green space, garden, and nearly 200,000 honey bees. Paule and Lindsey launched the nonprofit to eliminate blight in the city by repurposing vacant lots, promote honey bee conservation, and educate the community about bee farming and the benefits of honey bees, which provide vital pollination to plants. They educated themselves on beekeeping through classes at Green Toe Gardens in Royal Oak and Keep Growing Detroit, and brought in the nonprofit Peace Tree Parks to plant a garden on the lot so the bees had somewhere to pollinate. The farm’s three hives are home to roughly 200,000 honey bees—but residents won’t see that many flying around. Detroit Hives won a $1,400 micro-grant from Detroit SOUP, a series of potluck dinner events where community organizations and projects compete for funding. It’s received other donations, but much of the expense has come from out of pocket. 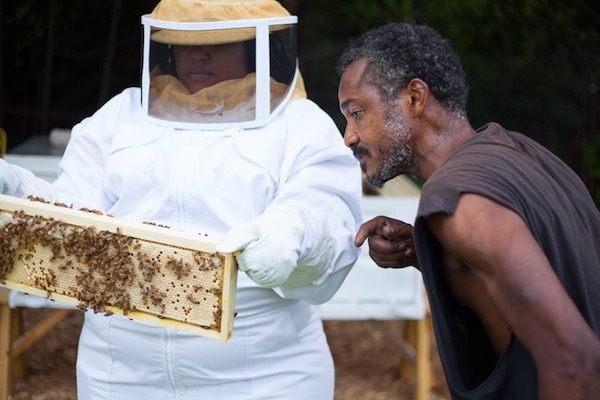 In the last several months, Detroit Hives has offered more than 30 tours of the bee farm to community members, and Paule has spoken to students at Southeastern High School and Burton International Academy. “A lot of people … are not too knowledgeable about bees, so it’s good for them to be exposed to something new, something different,” he says. Last spring, Paule visited Southeastern High School, offering students of an after school program a crash course on honey bees, how to protect themselves from bees, and what they could do to get involved if they’re interested. He then invited them to the farm, where a couple of brave students donned suits and got up close and personal with the bees, says Lavar Drummond, who was dean of students at the time. Full honey production takes about a year and a half, and so far, the bee farm has produced about 40 pounds of honey. Detroit Hives has sold some of it to Black Bottom Brewing Company in Detroit, and is in the process of bottling additional honey with plans to sell it at Eastern Market. The East Warren lot won’t be the only honey-based venture for Detroit Hives. Paule and Lindsey own another property on State Fair Avenue and Hoover Street that they’re trying to form into an eco-friendly space with an urban garden and bee farm. The property has a massive 32,800-square-foot parking lot, but they don’t plan to raze it. Instead, they’ll install the bee farm and raised garden beds using wooden planks. Paule is also working to acquire property behind the bee farm on East Warren that has two abandoned homes. He hopes to secure funding to tear down the houses and build a training facility and mini market for honey products.